While our Far Rockaway and Five Towns community has come to regard Achiezer as their anchor and go-to resource, something exceptional has occurred. The lines have blurred in the most beautiful way possible--Achiezer--the name that says it all has become an all-encompassing organization. Not as an organization, but as a people. Every one of us has become Achiezer. Over the past 6 years, Achiezer has grown into the very essence of its name. Achiezer has become the heart of our community and in turn, you-our dear friend and neighbor-are the very heartbeat. Be it volunteer or client, concerned neighbor or professional, each of you is connected to Achiezer and each of you is Achiezer. 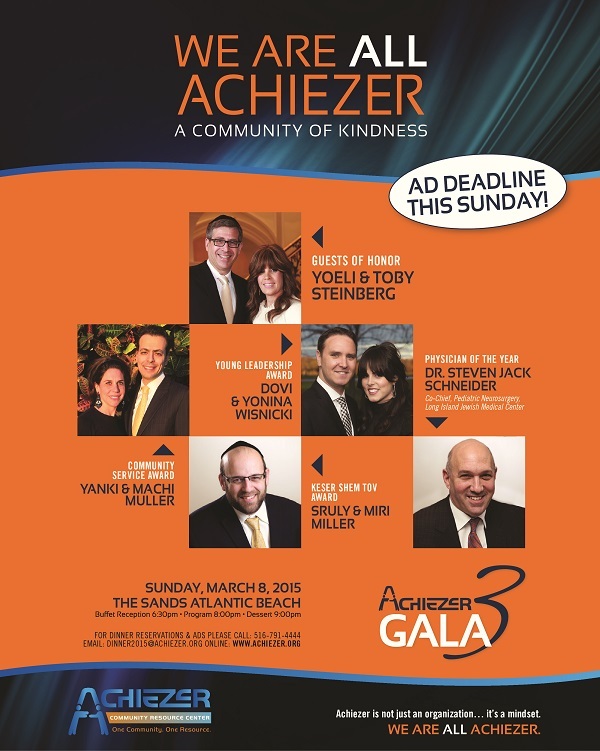 In just under two weeks, Achiezer will be hosting its 3rd Annual Gala; a momentous occasion where the community will pay tribute to our honorees, exemplary individuals who each embody Achiezer in their own right. None is just a name-each Honoree is a true partner and contributor to the success of what we have all come to know as Achiezer; they are each Achiezer at its greatest. Yoeli and Toby Steinberg are a couple whose chesed permeates both their professional and home life; the chesed of dignity and humility, of doing not what is easy, but what is right. They have passed this trait on as their children carry the mantle forward to the next generation. Their combined love for our community is Achiezer. As volunteers, Machi and Yanki Muller have become the stronghold through which Achiezer can care for our community on an individual basis. Be it a ride or a hot meal, organizational skills, a visit to a lonely person, Machi and Yanki are always available with a smile, spreading the warmth through our community. The warmth that is Achiezer. Sruly and Miri Miller embody community responsibility. Sruly has literally pushed off his schooling to accommodate the growing needs of our community's insurance enrollment. Miri herself sat at Sruly's side throughout the days following Hurricane Sandy fielding phone call after phone call, assisting countless individuals. "Hello, this is Achiezer" and indeed, she was. Yonina and Dovi Wisnicki personify selflessness at its best. Though most of us would say no thank you to a job description of full time work and no pay, Yonina jumped at the chance. Yonina's timely enter as the Affordable Care Act came into effect personifies the very center from which Achiezer operates. Dovi and Yonina are a couple who are there at those most crucial moments, and that is Achiezer. For Dr. Steven Jack Schneider, work and chesed have become synonymous. What better job than to heal the sick in body and spirit? Dr. Schneider's unique expertise saves lives; and even more, he has made himself available to Achiezer at all hours. Dr. Schneider's expertise and timeliness, coupled with his concern for every patient is Achiezer. Even with the hundreds of calls received each month, by utilizing our broad and diverse volunteer network, Achiezer continues to operate below the expected budget for an organization of its size. Achiezer continues to meet and collaborate with our community's wide range of organizations. Never has our community been banded together this strong. On Sunday, March 8th, 2015, Achiezer will be hosting its one and only fundraiser for the entire year. Your presence will be testament to what we have accomplished, together. We want you to be there - because you are Achiezer; because Achiezer belongs to all of us; and because Achiezer is a mindset, that propels caring people to action.